OMCAN CE-TW-0356 Conveyor Commercial Countertop 14 Pizza and Baking Oven. Exciting new Conveyor Countertop Pizza Oven! 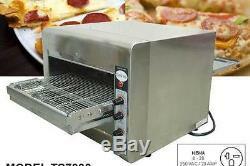 Pump out 14in Pizzas all day long and all day strong with this new conveyor baking oven. Designed to provide consistent heat with infrared heaters, this unit is equipped with a variable speed control and adjustable top and bottom heat controls! The Body is made of stainless steel and it can be used to cook pizzas, bagels, other breads and more! This high-capacity oven is ETL-approved for Commercial use and is ideal for large kitchens, diners, cafes and catering operations. In fact, this oven can bake up to 12 14in Pizzas per hour! Body is made of Stainless Steel. Adjustable top and bottom heat controls for great flexibility. Ideal for large kitchens, diners, cafes and catering ops. Excellent for Pizzas, Breads, Bagels and more! Produces 12 14in Pizzas per hour. Unit Measures 41 x 18.5 x 15.5. Please note this unit has a 220V (single-phase) electrics requirement. Therefore it ships with NO plug on the end to allow you to hardwire it directly to your power panel OR to allow your electrician to install the right plug for your particular 220v+ outlet. ALL ITEMS ARE GUARANTEED TO BE BRAND NEW. DEFECT AND DAMAGE REPLACEMENT GUARANTEE PROGRAM We stand 100% behind the products we offer. If your item arrives Defective, which is extremely rare as we only carry brand new merchandise with original factory-packaging, you must report the defect to us within 72 hours of the item being received. As such, please open all packages from us upon receiving them to ensure you meet this 72 hour time-frame. If you send packages to us or our warehouses without first contacting us, you relinquish all remedies under our Damage and Defect Replacement Guarantee Program. Please note that some warranties are limited and cover parts and not labor, and some have other restrictions against customer misuse etc. That said, if an item is truly out of stock, we make our best efforts to notate this in the Listing SUBTITLE. Product Descriptions are generally 100% accurate. That said, occasionally errors are made and/or typos may exist. Please note that we are not responsible for such typos. However if a description stated an item had certain major features which it did not in fact have, we will attempt to accommodate and work with you as we understand that these errors do occur and our only goal is to satisfy our customers. PRODUCT QUESTIONS We urge you to inquire regarding product features and availability prior to ordering to ensure you are absolutely clear in regard to the item you are purchasing. OUR MISSION Ultimately ReliaBuy is about doing business the old-fashioned HONEST WAY. While we realize this is not the norm in today's marketplace, it is our goal to return the norm back to these ethical ways. Help us accomplish this goal by becoming a valued ReliaBuy customer today! These items take additional time to reach you and are dropped off CURBSIDE, which means YOU are responsible for bringing the item from the curb into your desired location. Please see the above section entitled "DEFECT AND DAMAGE REPLACEMENT GUARANTEE PROGRAM" for full details. The item "OMCAN CE-TW-0356 Conveyor Commercial Countertop 14 Pizza and Baking Oven NEW" is in sale since Tuesday, December 29, 2015. This item is in the category "Business & Industrial\Restaurant & Catering\Commercial Kitchen Equipment\Cooking & Warming Equipment\Ovens & Ranges\Pizza Ovens". The seller is "reliabuy-co" and is located in Niagara Falls, New York. This item can be shipped to United States.